At least three people were killed in a gas line explosion and ensuing fire on multiple homes Thursday night in San Bruno, a city near San Francisco International Airport (SFO), authorities said. It is believed that a 24-inch Pacific Gas and Electric (PG&E) high-pressure gas line is the source of the explosion and fire. The fire erupted from a punctured petroleum pipeline beside a high school when a backhoe digging too close clipped the line, local media reported. But the PG&E has not confirmed that the explosion was from its pipeline.Two men were found dead after the initial explosion and another one died later from severe burns in the hospital, local media reported. Several Bay Area hospitals are reportedly receiving patients with burn injuries. The explosion happened shortly after 6 p.m. local time (0200 GMT Friday) in an area near the intersection of highways 280 and 380 in San Bruno, some 19 km south of downtown San Francisco, local officials were quoted by NBC as saying. The fire then spread to a residential area. Live TV footage showed a fireball up to 15 meters high in the air continues to burn as multiple homes and cars were set ablaze. 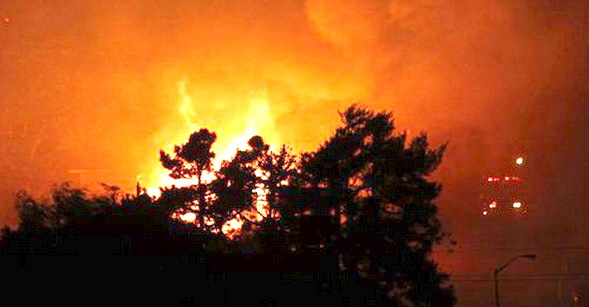 The fire is “burning out of control,” according the San Mateo County Fire Department. Fire trucks and helicopters have rushed to the scene. Authorities said fire crews are having trouble getting close to the source of the fire but are trying to attack the flames from the air and ground. SFO says it has told pilots to switch to instruments due to poor visibility. Residents are gathering at Tanforan Shopping center in downtown San Bruno. An evacuation center has been set up at the San Bruno Veterans Memorial Recreation Center. Have you ever thought of adding more videos to your weblog articles to keep the visitors more interested? I mean I just went through the entire content and it absolutely was very excellent but because I’m much more of a visual learner, I found that way to be significantly more useful. well, let me know what you think.